I am looking for a better solution on how to secure my tubing during recirculation. Last edited by Mad_Scientist on 23 Jul 2015, 07:43, edited 1 time in total. 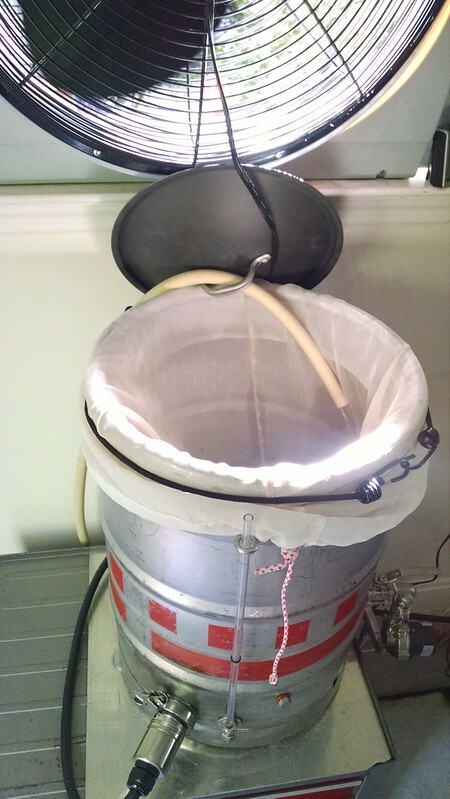 MS, if you have some Copper pipe that bends, you could make a J-type pipe bend, and put the " Straight J" under the Bungy Cord and hang the "Curve J" over the Keg, and insert the Hose thru it. Last edited by mally on 23 Jul 2015, 14:52, edited 1 time in total. How about a fitting thru your lid?? Closed lid mashing? Richard - Did you sort this problem out at all? Those racking cane holders are only $2 BTW, but if that is too expensive I have heard of others using "bulldog clips" from office stationery. The tubing is threaded through the metal ring part. already have to help secure this stiff hose up to that point, then a piece of "J" copper. lid I got at a garage sale. Last edited by Mad_Scientist on 12 Jan 2017, 08:32, edited 2 times in total.